I’m not dead, John. It was all a hoax. You were right. The hoax was a hoax. John Watson felt a chill slither down his collar. He shivered, someone walking upon his grave. Heavy wet drops slid down his cheeks like the cool caress of dead fingers. An explosion of thunder slapped John awake. The bench on which he sat shuddered. People in the park ran, fleeing for shelter from the storm. Behind John a muffled foomph, foomph, foomph sound, like the blades of an army helicopter starting, approached. Dazed and disoriented, John turned slowly to look. A large black bird landed and stared at him. Sherlock Holmes observed the bird study him from just inside the desolate shed. 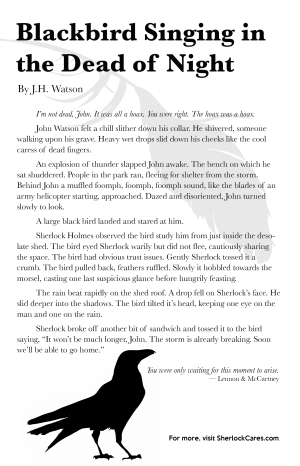 The bird eyed Sherlock warily but did not flee, cautiously sharing the space. The bird had obvious trust issues. Gently Sherlock tossed it a crumb. The bird pulled back, feathers ruffled. Slowly it hobbled towards the morsel, casting one last suspicious glance before hungrily feasting. The rain beat rapidly on the shed roof. 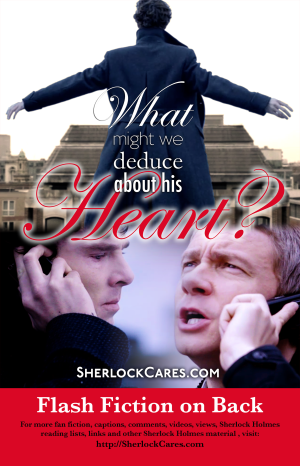 A drop fell on Sherlock’s face. He slid deeper into the shadows. The bird tilted it’s head, keeping one eye on the man and one on the rain. For the Sherlock Seattle Convention, I created a mini-poster handout with this flash fiction on the back. The .png version of front and back is below. They’re designed to be printed 2-up on 8.5″ x 11″ paper. This entry was posted in FanFic, Post-RF and tagged bbc sherlock, FanFic, john watson, Sherlock Holmes on October 4, 2013 by JH Watson.